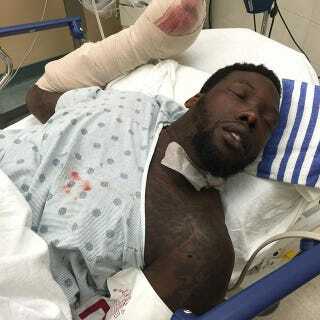 For days after Giants DE Jason Pierre-Paul injured his hand in a July 4 fireworks accident, we didn’t know anything more than that. We didn’t know the extent of the injury, or the operations required, or even how many fingers he had left...until ESPN’s Adam Schefter published a picture of Pierre Paul’s medical chart. There was a ton of debate at the time over the journalistic ethics of publishing the physical medical records rather than just the info, but the leaking itself was undeniably a violation of both law and hospital regulations. Today that Miami hospital announced it identified two employees responsible for the leak, and fired them both. The statement notes that Jackson Health Services settled a lawsuit related to the breach of medical privacy, likely filed by Pierre-Paul. I wrote at the time that the records were a good get by Schefter—people genuinely wanted to know Pierre-Paul’s condition—but thought that it was a strange move to publish the actual chart. Schefter and ESPN didn’t really gain much by publishing the image rather than just relaying the info, and in doing so made it very clear that the leak came from a limited pool of people with access to those records. It was a real risk to his sources, and they got caught. Unfortunately for reporters, this could discourage future leakers.